Along the banks of the Mississippi River in the area known as tri-cities, where the cities of Moline, Illinois; Rock Island, Illinois; and Davenport, Iowa form a consolidation the newest franchise in the National Basketball League began play after starting the season as the Buffalo Bisons for a few games, with General Manager Leo Ferris who was instrumental in developing the shot clock. Playing in the 6,000-seat Wharton Fieldhouse in Moline and known as the Blackhawks (115 years earlier it was the location of the Blackhawk war) the team struggled finishing in fifth place with a 19-25 record. 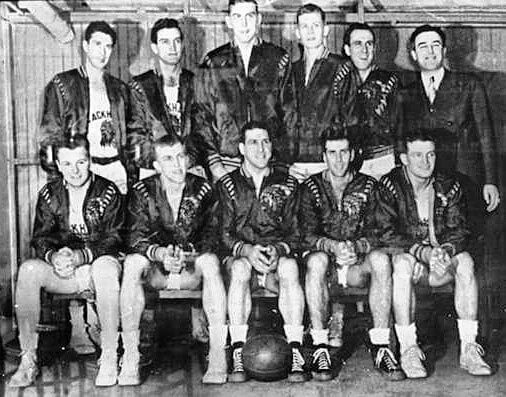 Among the players on the team was pioneer Pop Gates, who was a star on the all black New York Renaissance that won 68 straight games in the early days of professional basketball.